Nutrition is an ever-changing and advancing field. What’s unquestioned this morning could be debunked this afternoon. Test how up-to-date you are in this dietary exposé! You can tell a lot about a person by what they say they'd do if they were given a time machine. Some of us would dial it in for the middle of the 1980s, so we could disabuse the masses of their misguided nutritional notions. The whole-foods hippies of the 1970s were entering middle age. After a look in the mirror at a sagging this and a bulging that, they began believing every half-cooked book and commercial telling them the key to healthy living was filling their fridge with margarine, tofu, and low-fat … everything. We may not be to the promised land of nutrition yet—far from it!—but at least researchers can now say conclusively what was wrong with some of the health rules that we formerly swore by. Bypass the non-fat trap and other food myths with these tips from registered dietitian Andy Bellatti. You pass on pizza, skip the sweets, and double up on salad. You pile your plate with cuts of lean chicken, tomatoes, peppers, and green, leafy vegetables. Then you opt for a squeeze of lemon juice or top off an already healthy meal with a little balsamic. But you've unknowingly just backtracked. The problem: Your fat-free diet is costing you fat-soluble vitamins and nutrients. According to a study in Molecular Nutrition & Food Research, adding healthy fats like avocado, nuts, or even a tablespoon of full-fat dressing helps the body absorb vitamins A, D, E, K and other heart-healthy nutrients. They're also crucial to feeling full and satisfied after eating. Good luck sticking to your diet without them! We're not talking vegetables and beans here. Low-fat processed foods are where things become problematic, because they're often packed with sugar and refined carbohydrates, both of which are more intimately connected to the fat on your body than is the fat in, say, an artichoke. Really, it's a shame they both get called the same name. Rather than avoiding the F-word like the plague, a better choice is to pick the right fats and enjoy them without guilt, because when it comes to heart health, a little fat goes a long way. "Studies have consistently shown that monosaturated fats (in almonds, peanuts, and avocados), omega 3s—and even some saturated fats like those in coconuts and cocoa—are good for cardiovascular health," says Bellatti. "For men interested in bodybuilding, a good intake also helps with testosterone production." Milk is high in calcium, and calcium is key to bone health, so pouring a glass of 2 percent at breakfast sounds like the best way to do your bones a solid. 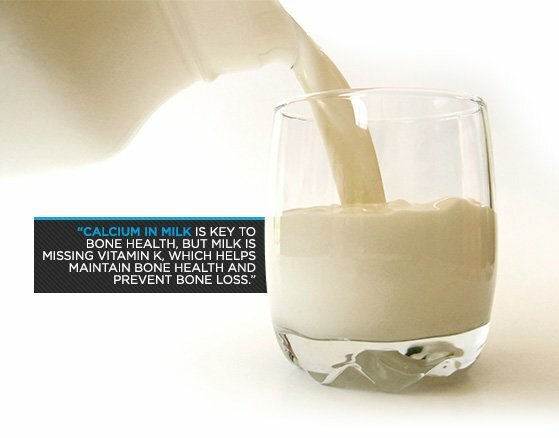 But one component is missing: vitamin K, which plays a huge role in maintaining bone health and preventing bone loss. "Once we're full-grown adults, we need to focus on minimizing loss," says Bellatti. "Vitamin K is crucial for that." Do you know what else vitamin K is crucial for? Making sure that the calcium you take in gets where it needs to go—and nowhere else. One of the vitamin's primary functions in your body is to help calcium bind to bone matter, so it can delay deterioration. It also inhibits that same calcium from building up in your arteries, where it can contribute to heart disease. While it's not abundant in milk—a cup of 2 percent milk has just 0.2 mg—vitamin K is abundant in dark, leafy greens. Kale contains a whopping 1,062.1 mg per cup. As an added bonus, most of these greens also contain calcium. Just make sure you eat the right ones. "Some greens like spinach are high in oxalates, which prevent calcium absorption," says Bellatti. "But there are also lots of dark greens like kale and bok choy that have low levels." These dark leafy greens' calcium-to-magnesium ratio makes for optimal absorption of both minerals. It's true that the normal American diet is high in sodium, but when it comes to lowering blood pressure, a diet of low-sodium canned soup isn't enough to swing it back the other way. In fact, many processed low-salt foods sacrifice potassium, which is key to controlling blood pressure. A study last year in the Belgian journal Acta Cardiologica went a step further, stating that upping potassium levels could balance out the deleterious effects of a high-sodium diet. You read right: The answer might be to eat more good stuff, not just to avoid bad stuff. The takeaway: Regulate your levels with more than that occasional banana. Swiss chard, lentils, sweet potatoes, and avocados all have higher potassium levels—961 mg, 731 mg, 754 mg, and 708 mg per cup, respectively—than banana's 422 mg, and they all have plenty of other healthy nutrients to boot. Skipping the pretzels might trick your palette into thinking you're lowering sodium levels, but taste isn't everything. A lot of food has processed sodium that simply helps to make it taste good, not just salty. 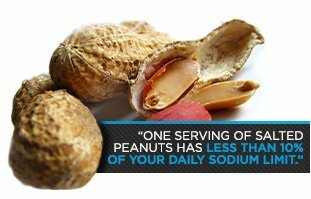 "One serving of salted peanuts has less than 10 percent of your daily sodium limit, but a lot of baked goods are high in sodium," says Bellatti. "We just can't taste the salt because it's part of the cooking process." For example, one Dunkin Donuts corn muffin contains 770 mg of sodium, only slightly less than the 900 mg of sodium in a 10-piece McDonald's chicken nuggets. Protein is a must after a weight-heavy workout, but don't forget the carbs. "Carbohydrates help restore glycogen," says Bellatti. "Replenished glucose helps you get in optimal condition for your next workout." Plus, you may have noticed carb-rich foods just seem to taste better after a hard training session. To make the most of your recovery period, plan ahead and include a post-workout meal with a 1:3 or 1:4 protein-to-carb ratio. Pair a can of tuna with healthy grains, or add a couple of bananas to an otherwise low-carb protein shake. 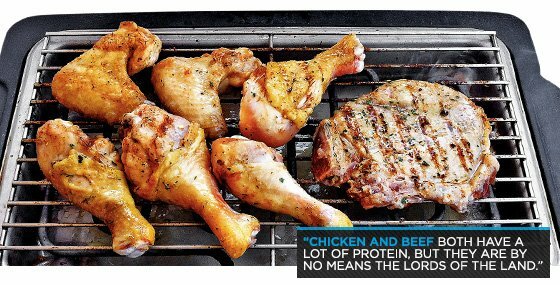 Chicken breast and ground beef both have a lot of protein, but they are by no means the lords of the land. Dairy and legumes have their fair share, and so do grains. A cup of cooked oatmeal has about 6 grams of protein, for example, and a standard serving of vegetables has 3-4 grams. Before you turn down your nose at the vegetarians, take note: A diet packed with nuts, seeds, beans, whole grains, and vegetables includes significant protein. A cup of oatmeal with a spoonful of peanut butter and a few tablespoons of hemp seeds stirred in registers a whopping 25 grams of protein. In contrast, one serving of turkey sausage only contains 11 grams. The nutritional value of many vegetables ends at the point where they are converted into gelatinous cubes. Margarine and other processed butter substitutes may be plant-based, but this doesn't mean they're healthy. "A lot of margarine uses soybean oil, corn oil, or even cotton oil which are some of the worst fats because they're inflammatory and have a high omega-6 to omega-3 ratio," says Bellatti. While both of these essential fatty acids need to be consumed, they also need to be held in balance, and the standard American diet has been tilted heavily toward omega-6 fats for far too long. "Inflammation at the cellular level is linked to a lot of chronic diseases, so when you have a high omega 6:3 ratio, the 3s—great for heart health, arteries, and blood flow—can't do a good job," says Bellatti. Still drawn toward plant-based fats? Stick to undeniably healthy options like coconut, avocado, sesame, and olive oil. 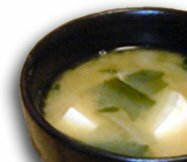 In the same way that eating an apple is worlds apart from eating apple pie, processed soy is a different animal—so to speak&Mdash;than fermented soy. "When soy is fermented, a lot of the anti-nutrients are not as active (and are broken down in the fermentation process). Plus, you're getting probiotics," says Bellatti. Those anti-nutrients, which are plentiful in unfermented soy, are bad news for most people. One of them, phytic acid, can block the absorption of crucial nutrients. Others can cause intestinal distress and have been linked to a number of serious medical conditions. The lesson here: Fermented soy is good soy. Bellati recommends avoiding soy isolates, as well as soy-based meat substitutes, protein bars, and cereals. Instead, seek out whole-foods counterparts like tempeh, natto, and miso. These are authentically healthy foods that can help support healthy digestion and nutrient absorption while delivering a healthy amount of protein. The USDA might say they both count as a serving of fruit, but there's no doubt that fruit is better eaten whole than in commercial juice. When you're having juice, you're primarily ingesting the sugar of the fruit. Most of the nutrients and all of the fiber are processed out. You're also losing plant-based phytonutrients, such as the flavonoid hesperedin, in the case of the orange. This nutrient, which is located in the pulp and peel of oranges, has been linked to reduced blood pressure and cholesterol, among other benefits. "A piece of fruit can have 50, 60, 80, 100 different phytonutrients, some of which help with heart health and some that help with inflammation," says Bellatti. 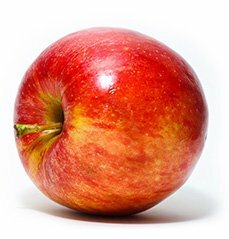 "When you're eating something like an apple, you're getting all of those compounds. When you're drinking apple juice you're not getting any of them." An exception to this rule is homemade fruit and vegetable juice. While you're not getting all the fiber, juicing a cucumber with kale, celery, and half an apple cuts most of the sugar from the packaged alternative while offering plenty more nutrients. Jack LaLanne knew best, in other words.